2 bedroom and 2 full bath Penthouse unit in Mackenzie Heights. Long list of updates in this extremely bright top floor home: updated kitchen with breakfast bar, granite counters & stainless appliances, recently updated washer/dryer, new lighting, custom fit blinds, new flooring, new gas fireplace insert and facing and custom built-ins in living room. This end unit has only 1 shared wall, generous room sizes and vaulted ceilings that assist with the spacious feel. Elevator or stair access to your top floor townhouse with separate entrance off of the common area courtyard. BONUS: useable attic offers great storage space with easy access drop down ladder. Pets and rentals allowed with restriction. Small complex of 8 residents with currently all owner occupied suites. Building has been rain-screened with window & balcony upgrades and a new roof all in 2009. Plumbing upgraded in 2014. 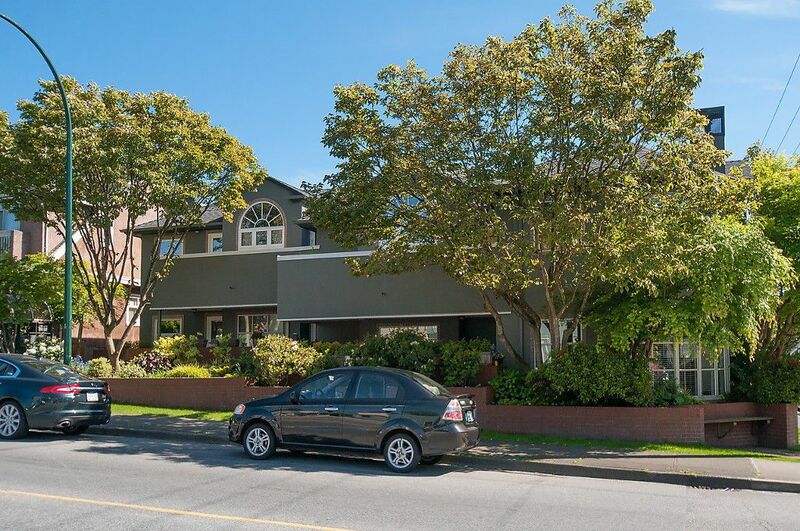 Fantastic location close to shopping, transportation, parks, Dunbar village & Kerrisdale. These suites seldom come available!